Size of Male: 70-80 lbs., 25-27 in. Size of Female: 65-75 lbs., 23-25 in. 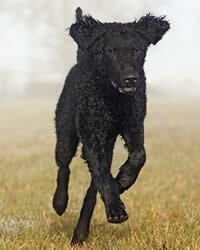 Of all the retriever breeds, the Curly Coated Retriever is among the oldest. Energetic and intelligent, the Curly is also one of the more independent retrievers. He may seem almost aloof compared to some of the other retrievers, but he is always willing to please. At home he is a gentle family companion, calm and affectionate. The Curly can make a good family pet for the right family. The Curly Coated Retriever was among the first two dog breeds recognized as a retriever in 1860 (the other being the Wavy Coated Retriever, now called the Flat-Coated Retriever). It?s believed that the Curly is descended from the old English Water Spaniel (now extinct), the so-called Retrieving Setter, and possibly the Irish Water Spaniel. The Poodle was added later. The St. John?s Newfoundland dog was probably also an ancestor. The Curly became very popular in New Zealand and Australia. They were first introduced to the U.S. in 1907. These dogs are very much admired for their steadiness and for being very tender-mouthed with the birds and ducks they retrieve. They excel in the water. The Curly Coated Retriever is an energetic and intelligent dog. They are considered trainable, but because they are so intelligent they need work or to be involved with activities to keep them from getting bored. Otherwise, they can become destructive in the home. They need an owner who is willing to get involved and do things with them. These are active hunting dogs and they enjoy hunting very much. But if your interests run to obedience, agility, rally or other dog activities, they can excel in these areas, too. As long as the Curly has a job to do, he will be happy. But if he is left untrained and unattended, watch out. He can find ways to destroy things in your home. This breed also needs a great deal of daily exercise as they are very active. They enjoy a good run and they love to swim. They can keep you tossing things for them to retrieve for a long time. If you have the time and energy to give this dog the attention he deserves, they can make a great pet or family dog. They are great with kids and they get along well with other dogs and pets. The Curly is a little more independent than most retrievers. He is self-confident and can be self-willed. He may be aloof with strangers. But in the home he is always gentle, affectionate, and eager to please. Living Environment – The Curly Coated Retriever could possibly adapt to living in an apartment but it would be difficult. These are high-energy dogs and they require a great deal of exercise. They do best in a country setting and prefer to have their own yards. The Curly does not do well as a kennel dog. They prefer to be with people. Grooming – Grooming for a CCR (for the Creedence Clearwater Revival fans) is not difficult. These dogs have a crisp curly coat that should be brushed as needed to remove dead hair. The coat has oils in it that keep it curly and repel dirt and dust. Don?t bathe this dog too often since bathing will remove the coat oils. Scissor occasionally to tidy up any straggly hairs sticking out. The Curly has a single coat and they don?t shed very much. Diet & Exercise – The CCR has normal dietary needs. Do not overfeed since they can easily put on too much weight, like many retrievers. These dogs do require a great deal of exercise. Try to take your dog for long walks, at least. They will enjoy having a run off-leash, preferably in a secure, enclosed area. You may also wish to bike with your dog. These dogs love to swim. Health – The CCR can be prone to canine hip dysplasia, dog eye problems and to epilepsy. If you are interested in getting a Curly, you should talk to a breeder about possible dog health problems in the breed. The Curly Coated Retriever is quite an intelligent breed but they can be too smart for their own good. They may become bored with dog training, which can make training difficult. You will need to find ways to keep your training fun and interesting for your Curly in order to succeed. Keep him guessing and don?t be too predictable and you will keep his interest. Use positive dog training (praise, reward) and you should achieve the best results.